Broward County and its economy are enjoying good times. Development is on the rise, companies are moving here (like our recent deal with Polenghi Group) and other companies are expanding here, such as retailers Hobby Lobby, Whole Foods Market and Trader’s Joe’s. When “luxury” and non-essential retail grows in a region, it is a sure sign in the rise of personal disposable income. The median household income for Broward County families from 2006-2010 (most recent period of data collection) was $51,694, compared with $47,661 for all of Florida and $43,605 for Miami-Dade County. Palm Beach County had the highest median household income, at $53,242, according to American Community Survey. Meanwhile, Broward County’s population grew by 6.9 percent from 2010 to 2014 (U.S. Census Bureau) and now stands at roughly 1.9 million residents. And we’re not just adding people, we are adding jobs. The county’s unemployment rate is currently 4.8 percent compared with 5.4 percent from a year ago. Two of the largest developments that are getting set to begin are The Manor@Flagler Village in Fort Lauderdale and Dania Pointe in Dania Beach. 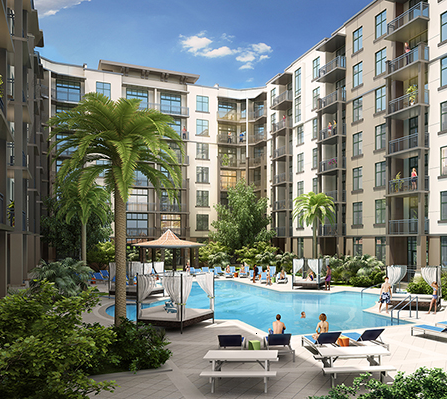 Manor@Flagler Village (rendering is shown here) will be a mixed-use project with 382 upscale apartments and 22,476 square feet of retail. Related Group is the developer and their target audience for the project are millennials. Dania Pointe has been years in the making and is huge, encompassing some 100 acres of land with 1,000 linear feet fronting I-95. Plans call for a regional open-air mall plus about 500,000 square feet of retail, office and residential space. Local folks will recall that some of the land was formerly occupied by Boomers, a family entertainment center and go-cart complex, and Dania Beach Hurricane, a wooden roller coaster that shut down in 2011. The development team is comprised of Kimco Realty, Robert Shapiro’s Master Development and Terry Salzman’s Salzman Real Estate Advisors. The project is slated to be built in phases and probably will not be complete until sometime in 2018.